NORTH CHARLESTON, S.C. — The emotion in Bill Coen’s voice was evident. Coen — the 2017-18 CAA Coach of the Year — is usually a stoic soul, but something extra seeped into his voice as he sat at the podium in the North Charleston Coliseum after Northeastern’s 83-76 overtime loss to Charleston in the CAA Championship. “I can’t think of a tougher one,” Coen said of the loss. The Huskies led by as many as 17 points in the second half, but Charleston stormed back — led by senior guard Joe Chealey’s 32 points and his perfect 16-16 clip from the charity stripe — to secure the win and earn their first bid to the NCAA Tournament since 1999. 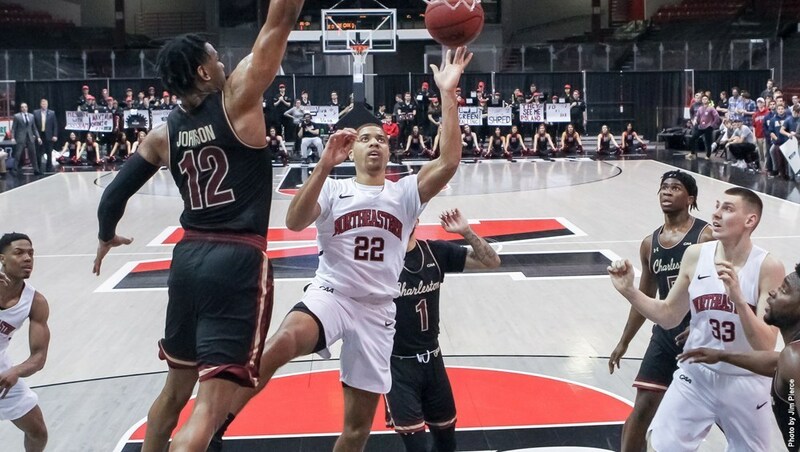 Redshirt junior Vasa Pusica tallied a team-high 30 points on 6-10 shooting from three, but the Huskies made too many mistakes down the stretch, including coughing up 20 turnovers. Chealey missed a potential game-winning three at the buzzer, with the sides tied at 65. The Cougars outscored NU 18-11 in the extra frame, spurred by two huge threes from junior Marquise Pointer (9 points) who had hit just one field goal in regulation. Charleston (26-7) receives the Colonial Athletic Association’s automatic bid to the Big Dance with the victory. Northeastern (23-10) was denied a bid after reaching the tournament back in 2014. The Huskies are a strong candidate to receive a bid to a postseason invitational tournament, such as the NIT or CBI. Northeastern led, 65-60, with 40 seconds left in regulation after a block from sophomore Shawn Occeus and an ensuing pair of free throws from redshirt sophomore Donnell Gresham. On the next possession, Chealey drew a foul on a three-point attempt, and hit all three free throws to pull the Cougars within two points. Pusica was called for a travel on the next play, giving Charleston the ball with 18 seconds left in regulation. It only took Chealey eight seconds to tie the game, 65-65, with a layup in the lane. Northeastern had a chance to take a lead with 10 seconds left, but Gresham dribbled the ball out of bounds on the ensuing possession. Chealey’s buzzer-beater rimmed out, forcing overtime. The Cougars took the lead right away in overtime on a bucket from sophomore Jarrell Brantley (18 points, 11 rebounds). Pointer’s two threes and a jumper from senior Cam Johnson put Charleston up 75-69. Northeastern got it to within three on a triple from sophomore Bo Brace, but the Cougars scored the last four points of the half on free throws to seal the deal. Sophomore Grant Riller added 20 points for C of C. Occeus (18 pts), Boursiquot (12 pts, 5 rebs) and Gresham (8 pts, 12 rebs) all made contributions for NU. Coen had high praise for his team, which was projected by the media to finish 6th in the CAA Preseason Media Poll. “This group is such a likable group,” Coen lamented after the game.